Celebrities and Big Boys flourish in hot summer nights. Okay, it’s mid-August. 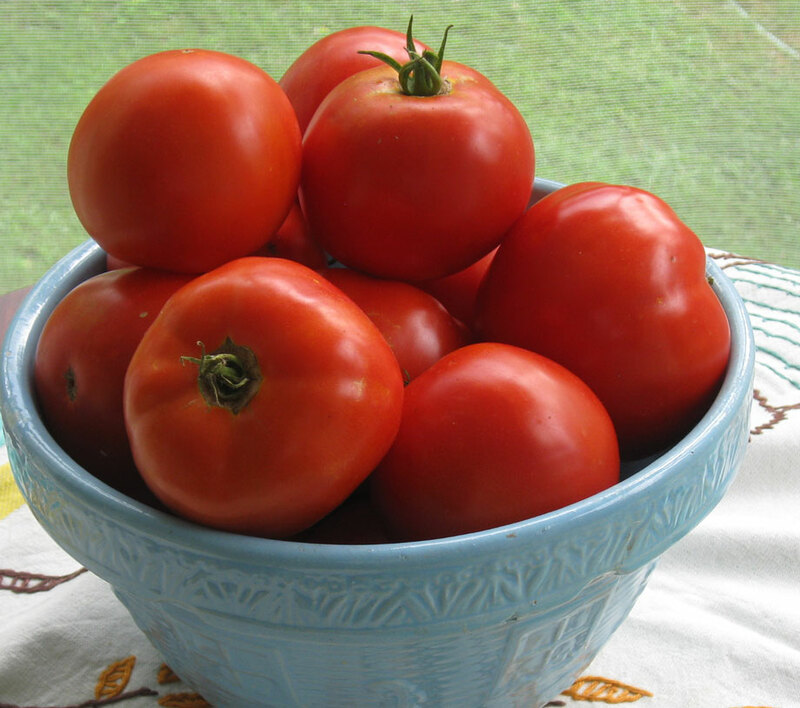 If you haven’t got any ripe tomatoes by now either you’re not trying or you live in Seattle. I used to dream of ripe tomatoes when I lived there. Yet it was nigh on to impossible to coax the plants to fruition, not for lack of sunshine, which is abundant to the point of ridiculous in August. But the night temperatures drop so low that tomatoes sulk and seldom achieve the sort of shiny overflowing pulchritude that comes so easily in the Mid-Atlantic region. This summer marks the first time in seven years that I’ve not only grown my own, but had enough to give away. However, I’ll say this for Seattle: they know how to make the most of the tomatoes they get. In the past decade of so, with the spread of social networks and the ubiquity of the devices in which they fester, there’s been a rapid proliferation of events engineered to bring together carefree young people, and those grown-ups who refuse to abandon all silliness even after they land a real job. Flash mobs were one of the first successful examples of this sort of phenomenon. Large groups of people would gather, as if spontaneously, to sing and dance, “Glee”-style, in public places. As the popularity of this sort of thing grew, it was perhaps inevitable that professional organizers would come up with a profit angle. But what does this have to do with tomatoes, you ask? Put on your goggles and swimsuit and I’ll tell you. It appears that we live in the golden age of the Tomato Battle. Young folks these days, not content to make lemonade out of the lemons which life hands them, have found a way to make merry with leftover tomatoes. In cities all across America and abroad, savvy marketers have put together those two staples of outdoor summer fun, the beer garden and the tomato garden, to make an unholy mess. Coming soon to a city near you. Actually, the most recent Tomato Battle in D.C. took place indoors, and, judging by the photos, was a kind of sedate affair compared to a full-fledged tomato battle royal. The Tomato Battle organizers understand that you can’t run a good battle without ammo. They anticipate going through 100,000 pounds of tomatoes in the upcoming Seattle Tomato Battle, scheduled for this coming Saturday, August 17th, at the Pyramid Alehouse. They also understand that the key to success in any tomato fight is timing. Thus the beer garden opens three hours before the first tomato flies. The organizers have thought of everything. They assure participants, and all those who object on principle to the idea of playing with food, that all the tomatoes used in the battle were already damaged (aka “rotten”) and thus could not have been used to feed the hungry. This disclaimer fits with Seattle’s firmly held convictions about keeping priorities straight: save the environment, help the helpless, then party like there’s no tomorrow. And, since Seattle is not known as a tomato town, there’s also a note in the fine print to acknowledge the contingency: “In the event of a tomato shortage we will hold a giant mud battle. The event will go on as planned but with mud instead of tomatoes.” Good to know.